This past weekend, I had the pleasure of visiting three Harris Armstrong homes of the 1940s. These houses are Saint Louis architectural treasures, but sadly the finest of the three, the Stuebner House of 5 Indian Hill in Ladue is faced with imminent destruction. It seems that land values in Ladue are so high that the three acres on which the house rests is much more valuable than the house itself. A developer now has an option to buy the property and intends to demolish this Prairie style house to replace it with a more eminently marketable pseudo-colonial facade. The new structure, replacing this work of art, will be an example of just what the ideals of modern architecture meant to replace. Sadly, the retrograde aspects of post-modern design have resulted in a revival of the worst tendencies toward fakery, artificial materials, contradictory structure, and economically driven design resulting in the visual degradation of our community. Armstrong's Stuebner House of 1939 exemplifies the best achievements of modern architecture: the use of natural materials, honesty of structural expression, an open relationship to a magnificent landscape, and attention to detail resulting in a coherent artistic statement. The present owners, Judy and Sydney Brilliant, have invested their own resources to update and enhance the house to meet and surpass all of the requirements of contemporary suburban life. They do not have maids, butlers, and nurses as the original owners did, but instead the latest conveniences offered by technology. All of this updating they achieved while keeping within the spirit of Mr. Armstrong's design concept. The Brilliants have unsuccessfully tried to sell the home to a family that appreciates the qualities inherent in it, but are now faced with selling the land for redevelopment. Harris Armstrong was St. Louis' pre-eminent midcentury modern architect, as has been documented in an exhibit recently on view at Washington University's School of Architecture. His Shanley Building in Clayton went far beyond any work built in St. Louis at the time, both technically and aesthetically. The project was awarded a silver medal at the 1937 Paris Exposition of Art and Technology. 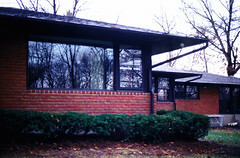 Armstrong's houses of the 1930s and 1940s were among the most innovative work being done in the Midwest. Photograph (scanned from slide) by Andrew Raimist, 1992. I am currently writing a book on Armstrong's long and fascinating career based on the materials stored in the Harris Armstrong Archives located at Washington University. One purpose of this work will be to increase public awareness of the many wonderful structures that can be found throughout the area, some of which are now threatened with destruction. I hope the community will begin to recognize the value of these works so they can be preserved and restored, rather than destroyed to make way for the latest false colonial boxes often built as a hollow, short-term investment, as empty in spirit and value as the worst junk bond sham.